The most important 1000 picture... As I'm thinking now! People living on an island finds a treasure, but it does not only do them good. This is not only an outstanding Czech film: it's an outstanding film, period. But I'd never even heard of it before two nights ago. Animation, puppetry and fairy-tale have a higher status in pretty much every culture except the Anglo-American, for reasons I can't fathom. 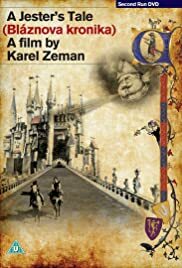 They are combined here with gentle satire that reminds me of Cervantes - indeed, Quixotic windmills feature early on in this masterly movie, as if deliberately making the link. So wittily. so seamlessly are the various contributory arts brought together that it feels like a single person's vision. Such is the extraordinary achievement of the collaboration between director Karel Zeman and writer Pavel Jurácek. The leading couple are played by Petr Kostka and Emília Vásáryová, now veteran performers in their homeland. They are wonderful, especially Kostka, with his warm smile, watchful eyes and effortless athleticism. They're joined by a bunch of skillful character actors, notably Miroslav Holub as the opportunistic Matej and Valentina Thielová as an icy, spoilt princess. The whole thing kept me smiling throughout its 82 minutes, including many laugh-old-loud moments. It's everything that Wes Anderson, Tim Burton and Terry Gilliam have been trying to achieve throughout their careers (they all avow Zeman as a major influence) but none of them have found the right balance of ingredients yet to come up with as superb a confection as this (although in Anderson's latest, THE GRAND BUDAPEST HOTEL  he's come nearer than he has before). There is however, a British movie that has approached THE JESTER'S TALE, at least in terms of its pre-Gilliam use of animation, and that is THE CHARGE OF THE LIGHT BRIGADE (1968), directed by Tony Richardson, written by Charles Wood. However, Richardson's film is angrier and more bitter in tone. Zeman's is wiser, more generous, more human. All the more remarkable, given that so much of his work,including THE JESTER'S TALE, was made during the Cold War, when his country was under the Soviet yoke.